Faith of Cranes weaves together three parallel narratives: the plight and beauty of sandhill cranes, one man's effort to recover hope amid destructive climate change, and the birth of a daughter. Hank Lentfer listened to cranes passing over his home in Southeast Alaska for twenty years before bothering to figure out where they were going. On a very visceral level, he didn't want to know. After all, cranes gliding through the wide skies of Alaska are the essence of wildness. But the same animals, pecking a living between the cornfields and condos of California's Central Valley, seem trapped and diminished. A former wildlife biologist and longtime conservationist, Lentfer had come to accept that no number of letters to the editor or trips to D.C. could stop the spread of clear cuts, alter the course of climate change, or ensure that his beloved cranes would always appear. And he had no idea that following the paths of cranes would lead him to the very things he was most afraid of: parenthood, responsibility, and actions of hope in a frustrating and warming world. "The cranes flying over my house in the fall have no assurance their California cornfield will not be filled with McMansions. When those birds leave California in the spring there is no guarantee their tundra breeding ground will not be host to another oil rig. Still . . . they teach their young the way. During the months of my wife's pregnancy, I slowly realized my role as a parent will be not to prevent the heartbreak, but to migrate through it, to find places of calm and safety along the way to rest and feed the spirit." 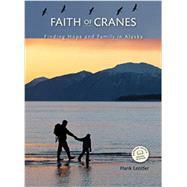 Faith of Cranes is Lentfer's quiet, lyrical memoir of his home and community near Glacier Bay that reveals a family's simple acts-planting potatoes, watching cranes, hunting deer-as well as a close and eccentric Alaskan community. It shows how several thousand birds and one little girl teach a new father there is no future imaginable that does not leave room for compassion and grace.